Labor Day, the unofficial end of summer, has passed. 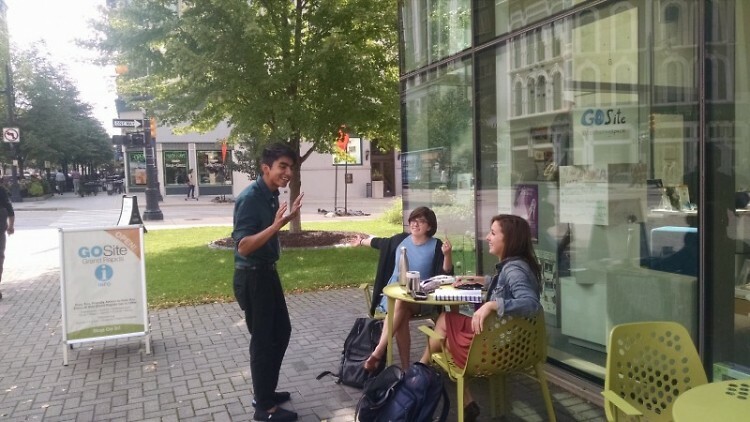 School is in session, ArtPrize Eight is around the corner, and the GoSite at Grand Rapids Art Museum is enthusiastically preparing to welcome visitors to downtown Grand Rapids during the one of a kind art competition. The GoSite, a unique visitor center providing information to the destination traveler as well as locals, is expanding its expertise by collaborating with GRAM Guest Services and ArtPrize Visitor Support to ensure visitors to ArtPrize Eight have a memorable experience. Combining resources with GRAM Guest Services means visitors will have more opportunities to get help navigating the city, exploring the art competition, as well as expert advice about restaurants, hotels, shopping, parking, transportation, and of course, viewing the art. Grand Rapids Art Museum is one of eight ArtPrize HUBs; theirs dubbed Center City HUB @ GRAM. This means visitors will be able to register to vote, buy merchandise, get ArtPrize maps, and have access to ArtPrize-studied staff that can assist with any technical issues with the smartphone app. In the past, this full service was only provided at the HUB/ArtPrize headquarters on Sheldon Avenue. Like last year, the GoSite will still have a main desk inside The Museum Store staffed with knowledgeable GoSite Guides, providing a "mini" version of its home base which overlooks Rosa Parks Circle. Visitors will be able to access information from a self-serve kiosk, pick up maps, brochures, Beer City Passports. If you happen to forget to charge your cell phone before leaving the house, the GoSite will have a charging station with universal chargers. The GoSite will be in its temporary location beginning September 10 to allow community guest WOOD TV8 time to transform the space into their ArtPrize studio to broadcast during the event from September 21 to October 9. While GoSite Guides were staffed outside the building along Monroe Center last year, ArtPrize will add a visitors booth outside The Museum Store which will complement the newly refocused GRAM visitor experience inside. Additionally, visitors may look for the GoSite Guides and their mobile carts outdoors near GRAM’s front entrance and indoors in GRAM's lower and upper lobbies. "ArtPrize is thrilled to collaborate with the GoSite for our eighth annual event," Anne Rosenbaum, ArtPrize Community and Visitor Support Manager said of joining forces. “The GoSite provides Grand Rapids visitors with a warm welcome as well as resources and information year-round. With their location in the heart of the city, they'll be a fantastic partner as we expand the core ArtPrize visitor services through our Neighborhood HUBs program at this year's event." Working closer with ArtPrize Visitor Support will fine-tune the outgoing information to all visitors to Grand Rapids during the three-week event. With all of the exciting changes to improve the visitor experience of ArtPrize Eight, the GoSite is also preparing for the influx of Beer City Brewsaders: lovers of local craft beer. For those unfamiliar, the GoSite has been facilitating this Beer City Passport program that its collaborative partner Experience Grand Rapids rolled out last October just after ArtPrize. Since then, nearly 4,000 city visitors and locals have become Brewsaders. Craft beer lovers pick up a passport with 23 breweries listed, receive eight stamps, and bring them back to the GoSite or mail them in to Experience GR to redeem an official Brewsader T-shirt. “Experience GR is excited to welcome beer enthusiasts during ArtPrize,” said Kate Herron, Marketing Director at Experience GR. “In preparation, we are ramping up our Beer City Brewsader t-shirt inventory, and working with the area breweries to ensure that they have large quantities of passports on hand, and plenty of stamp ink!” The GoSite will be stocking the T-shirts at their temporary location at The Museum Store, as well as brewery maps and blank passports. Since last ArtPrize, the first year for the GoSite to roll out mobile carts downtown, the GoSite has been working closely with another collaborative partner who will have a bigger presence during ArtPrize Eight: Downtown Grand Rapids Inc.'s Downtown Ambassadors. The Downtown Ambassadors are the city's mobile hospitality crew all year round. “The Downtown Ambassadors are ramping up for ArtPrize. We’re going to be on foot 24/7, making the trash go away, cleaning the streets, and wayfinding. And we’re going to have a blast doing it,” said Marcia Rapp, a Downtown Ambassador. The Downtown Ambassadors’ presence is a wonderful service and resource that all of the businesses and organizations in the heart of the city enjoy. They are often visitors’ first welcoming encounter with Grand Rapids and also provide safety, as well as keeping the streets clean. GoSite staff enjoy the opportunity to exchange information with the city's frontline, and the relationship is mutual. Think you might need some questions answered or curiosities directed while checking out ArtPrize Eight this year? Be on the lookout for GoSite Guides, Downtown Ambassadors, and every helper in between out there. They’ll be around and ready.